Why the unsettling phantom-like black space in the fabric of the universe? 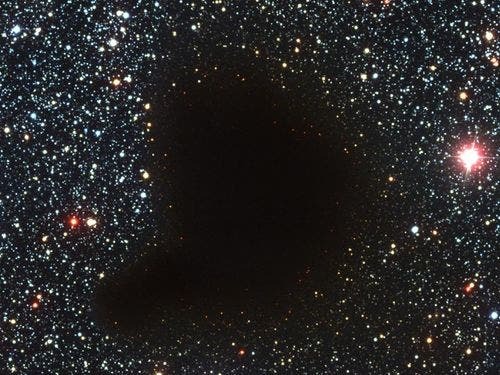 What used to be considered a void in the sky is now known to astronomers as a dark molecular cloud – a high concentration of dust and molecular gas absorb practically all the visible light emitted from background stars. Astrophysicists such as Paul Davies of Arizona State propose that these dark quiescent voids are ideal habitats for post-biological intellience that might be in the form of an extraterrestrial quantum computer that would thrive in the coldest possible environment. The eerily dark surroundings help make the interiors of molecular clouds some of the coldest and most isolated places in the universe. One of the most notable of these dark absorption nebulae is a cloud toward the constellation Ophiuchus known as Barnard 68, pictured above. It is not known exactly how molecular clouds like Barnard 68 form, but it is known that these clouds are themselves likely places for new stars to form. It is possible to look right through the cloud in infrared light. SETI Chief Astronomer, Seth Shostak, has speculated that these frigid molecular clouds may be ideal habitats for advanced ET AI machine intelligence. In 1964, astrophysicists in Fred Hoyle's scifi novel, The Black Cloud, become aware of an immense black cloud of gas that enters the solar system. The cloud, moving to interpose itself between the sun and the earth, could wipe out most of the life on earth by blocking solar radiation and ending photosynthesis. Astronomers and other scientists gather in England, where they discover that the cloud is a super-organism, many times more intelligent than our human species. Hoyle's Black Cloud lives in the vacuum of space held together by electric and magnetic interactions, lives in the vacuum of space and is composed of dust-grains instead of cells. It derives its energy from gravitation or starlight, and acquires chemical nutrients from the naturally occurring interstellar dust. The cloud has a network of long-range electromagnetic signals that transmit information and coordinate its activities, much like our nervous system. Like silicon-based life and unlike water-based life, the Black Cloud can adapt to arbitrarily low temperatures of a cold universe, making it immortal, impervious to the eventual death of a star. In his essay, "Is Life Analog or Digital?" Freeman Dyson of the Princeton Institute for Advanced Studies suggests that "an analog form of life, such as Hoyle's black cloud, adapts better to low temperatures, because a cloud with a fixed number of grains can expand its memory without limit by increasing its linear scale." In a fascinating case of life imitating art, physicists have discovered over the past few years intriguing evidence of life-like double-helix structures formed from inorganic substances in space which raises the question of whether extraterrestrial life could be composed of corkscrew-shaped formations of interstellar dust. The findings hint at the possibility that life beyond Earth may not necessarily use carbon-based molecules as its building blocks and they may also point to a possible new explanation for the origin of life on Earth. The international team has discovered that under the right conditions, particles of inorganic dust can become organized into helical structures. These structures can then interact with each other in ways that are more usually associated with organic compounds and life itself. Led by V.N. Tsytovich of the Russian Academy of Science and the Max-Planck Institute for Extraterrestrial Physics and the University of Sydney, the team studied the behavior of complex mixtures of inorganic materials in a plasma. However, using a computer simulation of molecular dynamics, Tsytovich and his colleagues demonstrated that particles in a plasma can undergo self-organization as electronic charges become separated and the plasma becomes polarized. This effect results in microscopic strands of solid particles that twist into corkscrew shapes, or helical structures resembling DNA. These helical strands are themselves electronically charged and are attracted to each other. Tsytovich reported they can divide to form two copies of the original structure and can also interact to induce changes in their neighbors. They can even evolve into yet more structures as less stable ones break down, leaving behind only the "fittest" structures in the plasma. Could helical clusters formed from interstellar dust be somehow alive? "These complex, self-organized plasma structures exhibit all the necessary properties to qualify them as candidates for inorganic living matter," muses Tsytovich, "they are autonomous, they reproduce and they evolve." He added that the plasma conditions needed to form these helical structures are common in outer space. Plasmas can also form under terrestrial conditions, such as the point of a lightning strike. The researchers speculate that perhaps an inorganic form of life emerged on the primordial earth, which then acted as the template for the more familiar organic molecules we know today.